That’s four cylinders and 200cc of awesomeness. 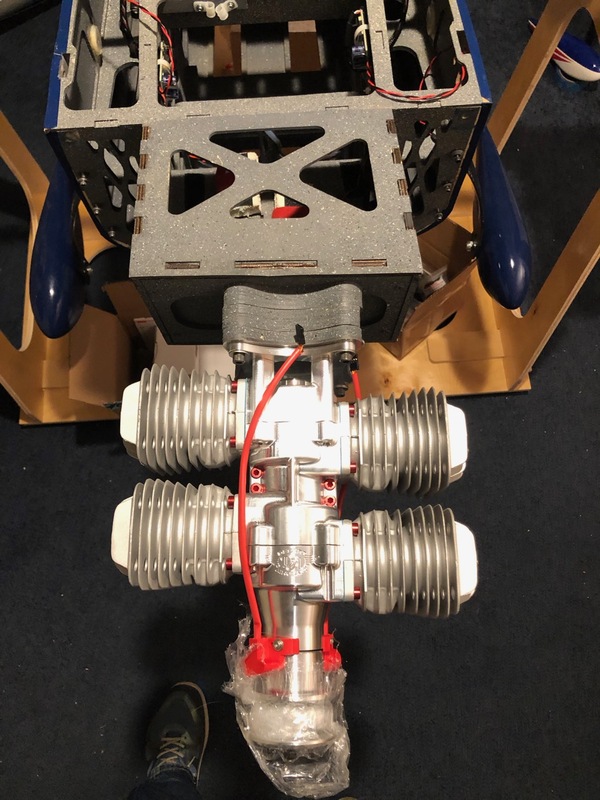 This will turn a 3-blade, 29 inch prop, and produce about 19 hp. It should be more than enough for a 40+ lb plane. 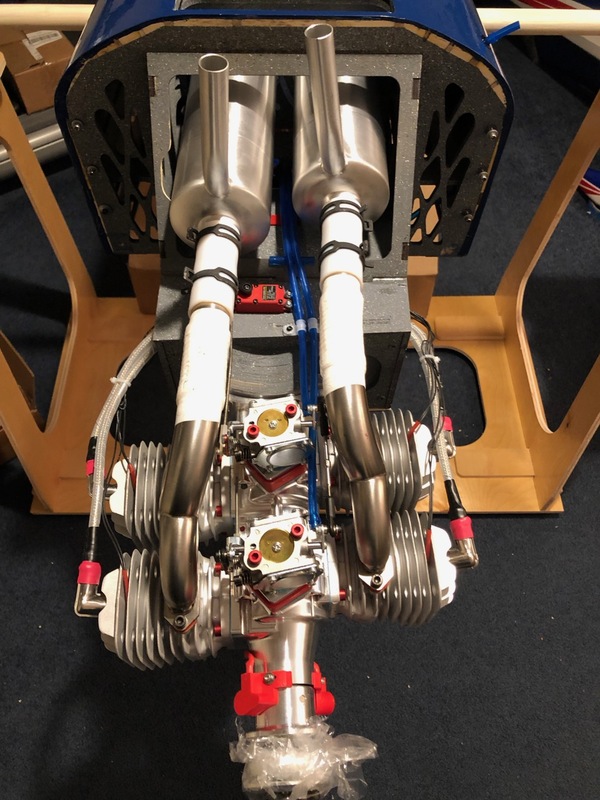 2x Tech-Aero Ultra IBEC units to power the ignition modules from the receiver. These are redundant and allow me to kill the motor from my transmitter. 2x Head temperature sensors. I never want to see the head temperatures climb anywhere above 350°F. Next up, bolt the motor on. I need a bunch of spacers to get the proper spacing between the spinner/propeller and the cowling. Plumb the fuel system. 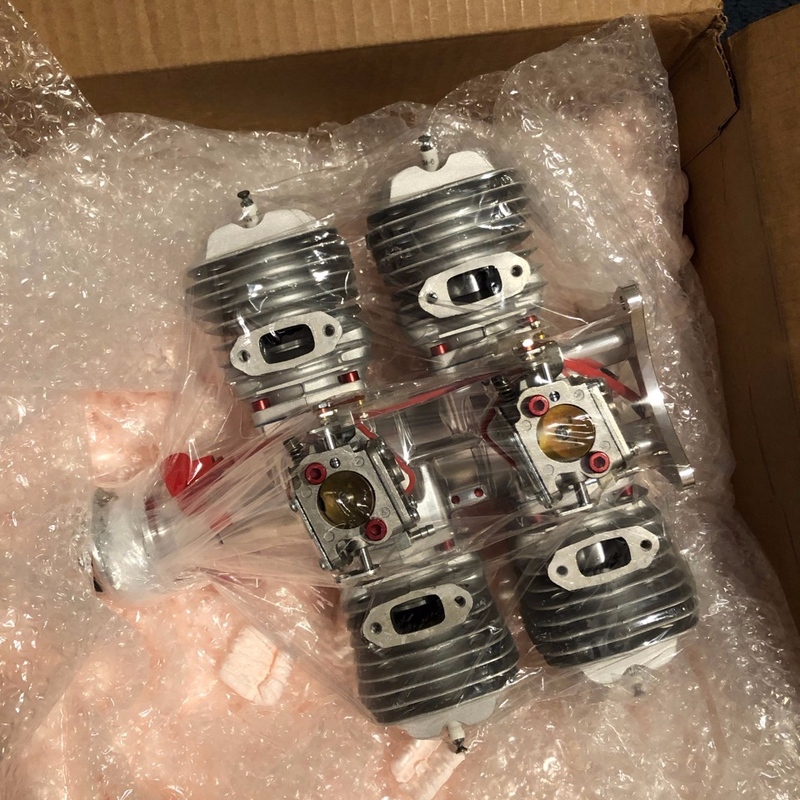 I’m using two tanks for this system — one for each carburetor. This way each carburetor gets a good fuel supply. To make thinks work properly, I need to connect each tank’s vent and fill port together. This lets the tanks act more like one tank. Time to install the throttle system. Exhaust system is next. Since I will be flying IMAC where sound is part of the score, I am going with canister mufflers. I want as quiet of the plane as I can get. Time to test run it! Since this is a new motor, the fuel system is dry. You will see me spending about a minute just flipping the prop to pull in fuel. At about 0:35 I turn on the ignition and keep flipping till the engine pops. Open the choke, and start her up. Now that it all runs, it’s time to cover everything up with the cowl and declare victory. Next up is programming the radio, and then it’s time for the maiden flight. 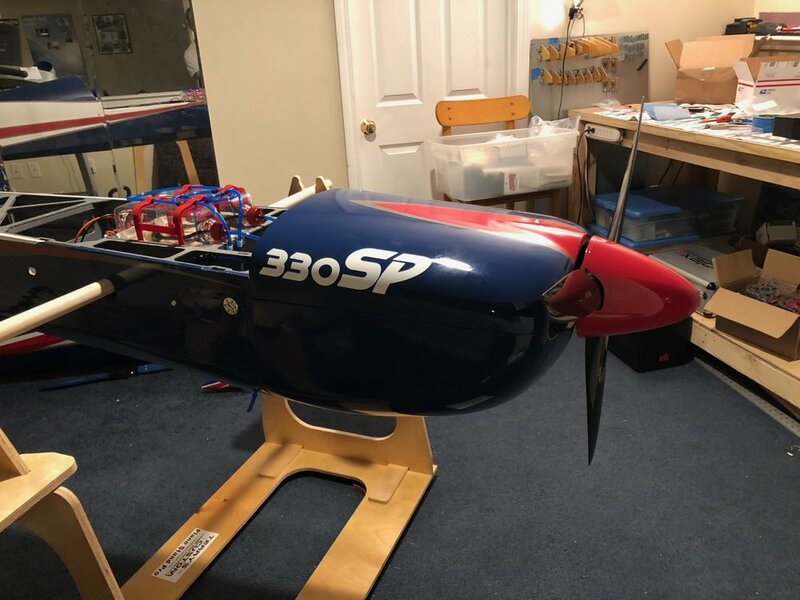 I need to equip the new plane with a brain and servos. This plane will require nine servos. All servos come from ProModeler. Rather than use some of the more name brand servos, I decided to go with this small business that specializes in servos for military drones. It’s a great, local business where the owner is happy to talk to you, and he stands behind his products. First up, it’s time to make some servo extensions. I like to make my own rather than buy them. By making my own, I can get the exact length I want. I figure there will be somewhere north of 30ft of extensions in this plane. Everything came from Hansen Hobbies. Time to start crimping since there are lots of extensions to make. 2x for the ignition Tech Aero IBECs. I am using 20AWG wire instead of the usual 22AWG wire because my wire lengths are so long. It makes building the servo connectors a little tricky. One trick I use is to use a fresh blade and trim any excess insulation off the wire before pushing it into the connector. Otherwise, the extra insulation makes it really difficult to push into the connector. 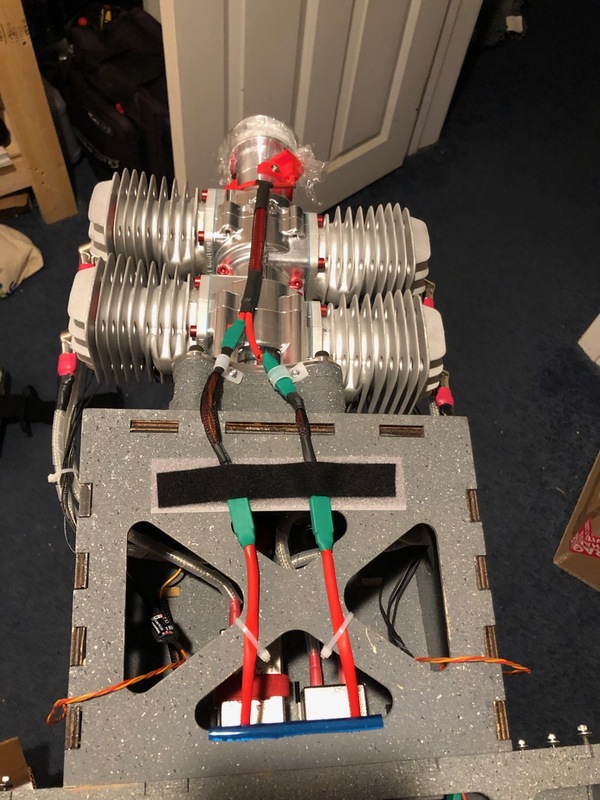 Need to do a little soldering to build the wire harnesses for the ailerons. 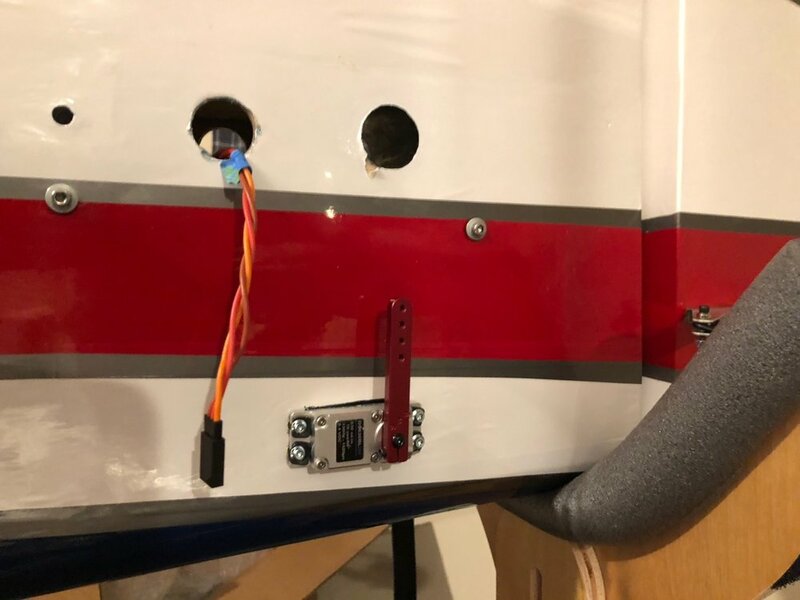 Since each wing panel has two servos, I want a simple, foolproof solution for plugging in each wing panel. The MPX connectors have 8 pins. 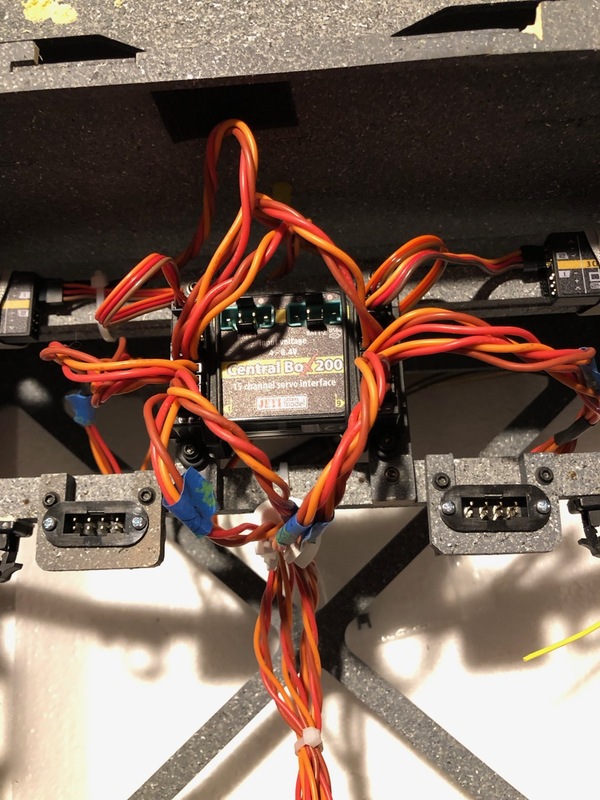 I will use 6 to allow for two servos per connector. Now I have some wires, it’s time to install some servos. Adding the receiver into the void so all these servos have a brain. You can also see the MPX connecters on the left and right sides of the photo. This is where the ailerons will be plugged into when the wings are attached. I still need to add some more wire keepers to clean things up and add the redundant power, but this is starting to work now. Finally, we can see something move. Here is the rudder. Note, this required balancing the two servos to work in unison. Otherwise, these servos are strong enough to rip the arm right out of the rudder. Each servo can lift nearly 40lbs!